WOW. Did you ever see a toggle switch as unique as this in any high street chain? It’s the kind of switch that attracts your eye. It’s fascinating to look at. Mesmerising some might say. 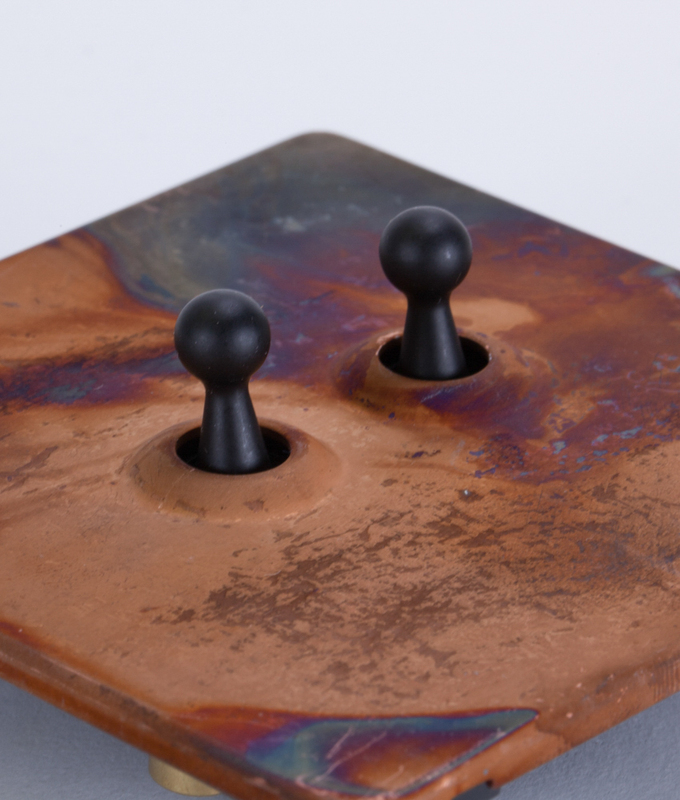 We designed this copper single toggle switch ourselves and despite that, we’re still in awe of how good it looks. We’ve done our best to capture the beauty of these sockets in the photos, however, the finish of each one is unique and may differ from that shown. Having said that, they do all age with use to look less ‘new’ and more ‘industrial’. We will, of course, endeavour to match your items if you’re ordering a set. Toggle switches are without doubt the neatest way to turn your lights on and off. 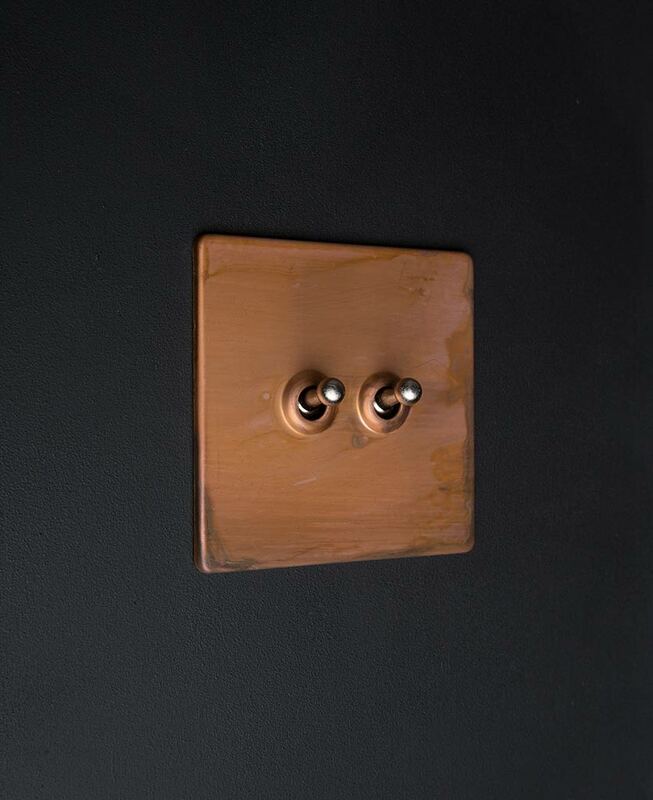 Our copper double toggle switch is great for adding an authentic warehouse factory accent to your room. This is one switch that’s better when made a feature of; it looks fabulous in a minimalist room and really injects dynamism into a monochrome palette. Imagine it against a dark grey or pale blush pink wall. Breath-taking. 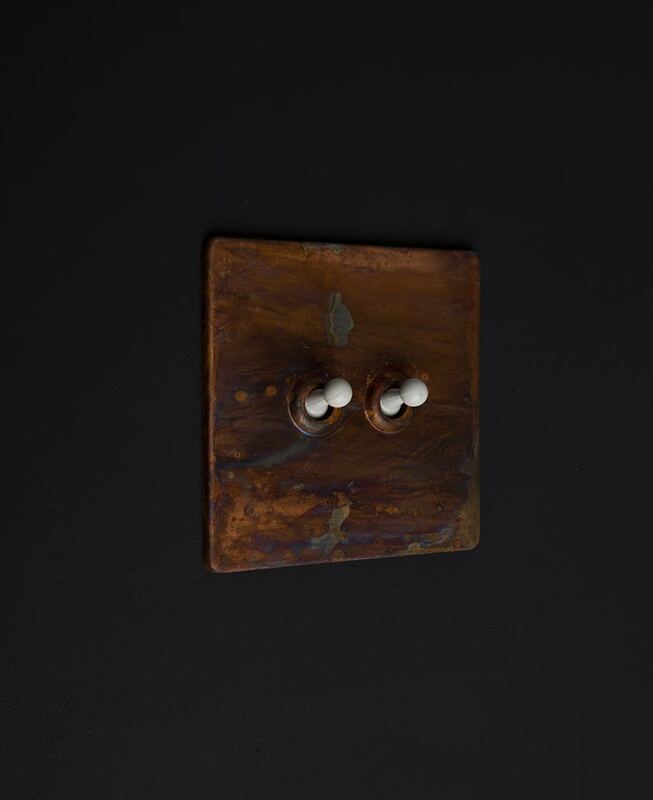 Our industrial vintage copper double toggle is one quality switch. Because of how these tarnished copper switches are finished, each one is unique and in fact rather like a miniature work of art. Beautiful in any modern rustic or retro-inspired interior. Absolutely stunning on a plain white wall where they really stand out. 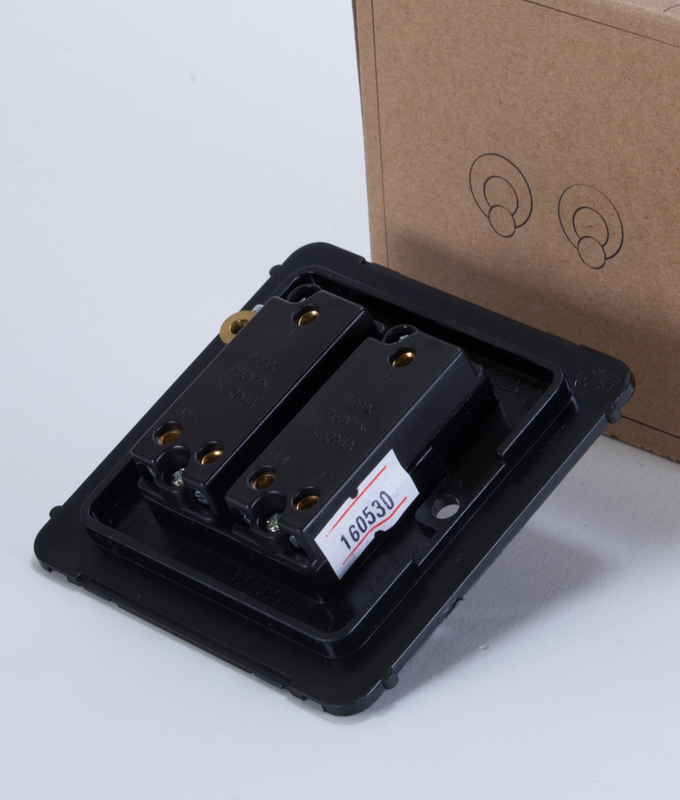 Our copper toggle switches are exclusively designed by us and only sold by us online. You won’t stumble across them in a bricks and mortar shop, and not everyone will find copper switches like these. Copper accents are just the thing to inject interest into a room and whilst polished copper is very a la mode this distressed copper is a whole different ball game. More organic and more natural feeling. It’s just beautiful; the colours and patterns achieved on the copper are amazing and of course, each is unique. 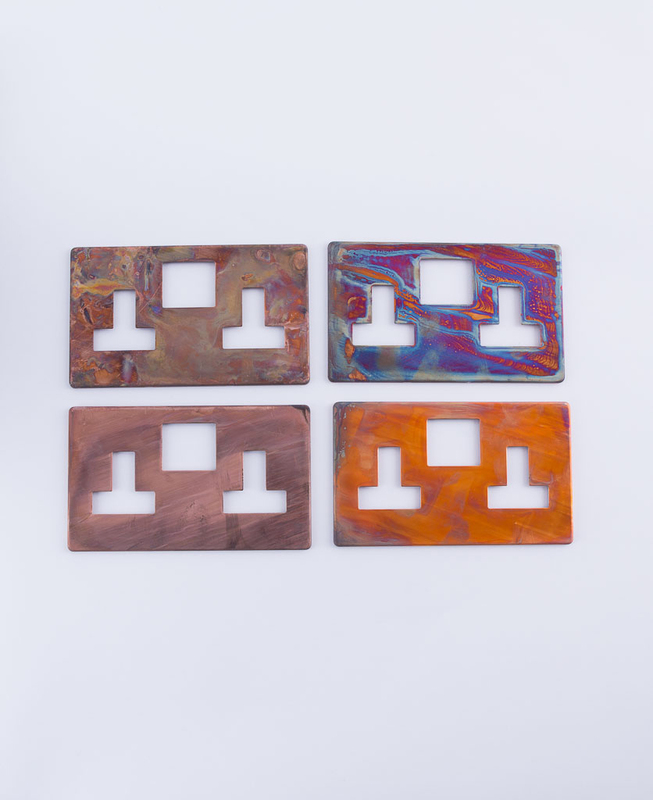 Stand out from the crowd and adorn your walls with these wonderful copper toggle switches. You’ll be so pleased if you do. Install some of these highly individual matt copper switches and sockets to stamp your individual style on your interior décor. All of our switches, dimmers and sockets are ideal finishing touches for any industrial warehouse inspired room… That’s exactly what we designed them for after all. 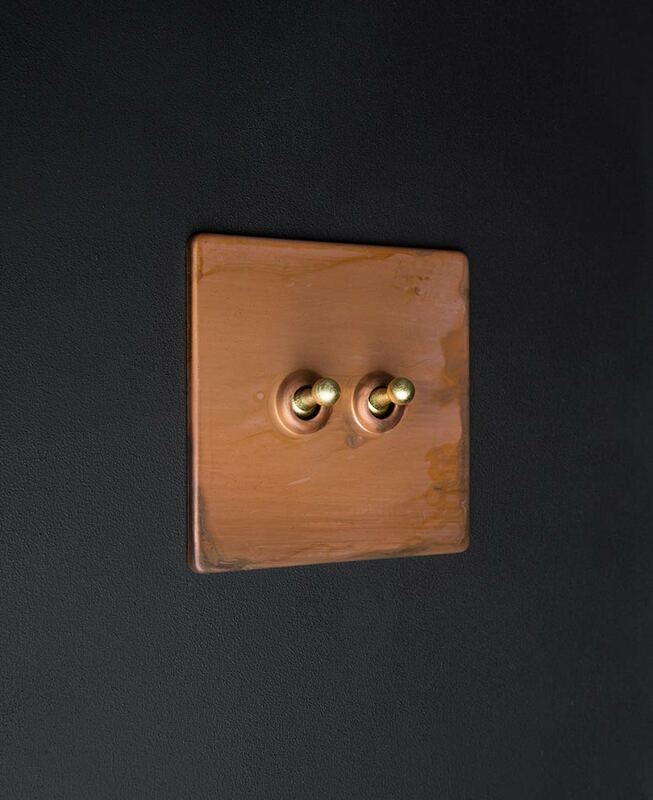 And if you love this 2 gang toggle copper switch, check out the matching 1 gang version and our other coordinating copper light switches and plug sockets. If you’re struggling to get your head around what light switch you need for what purpose… Perhaps have a read of our guide light switches explained. It tells you the difference between 1, 2 & 3 gang plus when to use 1 way, 2 way and intermediate switches.